Abstract: Data analysts use computational notebooks to write code for analyzing and visualizing data. Notebooks help analysts iteratively write analysis code by letting them interleave code with output, and selectively execute cells. However, as analysis progresses, analysts leave behind old code and outputs, and overwrite important code, producing cluttered and inconsistent notebooks. 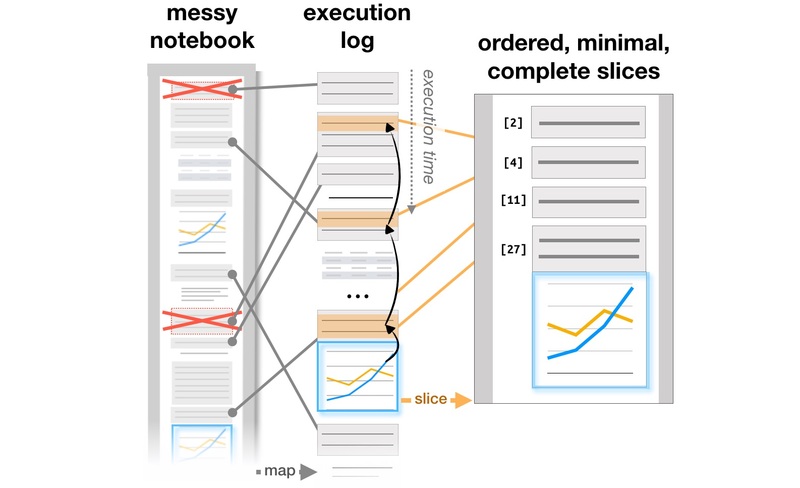 This paper introduces code gathering tools, extensions to computational notebooks that help analysts find, clean, recover, and compare versions of code in cluttered, inconsistent notebooks. The tools archive all versions of code outputs, allowing analysts to review these versions and recover the subsets of code that produced them. These subsets can serve as succinct summaries of analysis activity or starting points for new analyses. In a qualitative usability study, 12 professional analysts found the tools useful for cleaning notebooks and writing analysis code, and discovered new ways to use them, like generating personal documentation and lightweight versioning. If you want to try out out code gathering tools or view the source code, check back soon. We will post the code and an alpha version of the tools when we give the talk for the paper on May 6, 2019.